An ecstatic Paul Gilligan enjoyed Festival success with his first runner when Bertie’s Dream galloped clear of Najaf on the run-in to take the Albert Bartlett Novices’ Hurdle. The winner was Andrew Lynch’s second winner of the meeting, and rewarded his backers at 33-1 - from the scenes of jubilation it seems likely members of the Half A Keg Syndicate who own him had availed themselves of bookmakers’ cash. Paddy Power gave Bertie’s Dream a 33-1 quote for next year’s Ladbrokes World Hurdle, but Gilligan was living for the day, and said: “I’m speechless and cannot believe it. We really did think he would run well, but Cheltenham is Cheltenham and you don’t come here thinking you are going to win. “I did fancy him because the horses are flying at home and we were unlucky not to have a double last Sunday. Things had kicked into gear and to have a winner here - money can’t buy it. “The rain didn’t matter to him because he goes on any ground. Good horses go on any ground and he’s a good horse. He never runs a bad race and ran a super race here in November [when third to Tell Massini who was pulled up in today’s race] and was just behind Reve De Sivola who ran a good race here earlier this week [second in the Neptune Investment Management Novice’s Hurdle]. “AP rode him that day and he felt that without another 50 yards he would have been second. Victory at the Cheltenham Festival was a dream come true for the members of the Half A Keg Syndicate from Dublin, which is run by Conor Broderick, who named the horse after his late father. The delighted co-owner of Berties Dream said: “This is our first horse with Paul (Gilligan). We bought him the April before last - he didn’t even have a shoe on him, he was straight from the field. For jockey Andrew Lynch, Berties Dream’s victory gave him yet more reason for celebration as the young jockey also won the Irish Independent Arkle Chase on Sizing Europe on Tuesday. He said: “All he does is stay. He’s won over shorter trips in Ireland but on heavier ground. Coming down the hill I thought we had a chance. We just missed the last a bit. I couldn’t believe it really. I’ve been lucky to be on two really genuine horses. Paul Nicholls was delighted with the effort of Najaf to finish second to Berties Dream in the Albert Bartlett Novices’ Hurdle and the seven-year-old will not be seen out again this season. “He’ll be going chasing in the autumn, that was what he was bought for and he won’t run again this season. 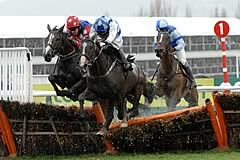 I was delighted with his run there,” said Nicholls. Najaf was bought for 250,000 euros at Arqana’s sale at Saint-Cloud in November by Highflyer Bloodstock and is owned jointly by the families of leading owners David Johnson and Andy Stewart. Fourth-placed Arvika Ligeonniere is also set for a chasing career. Kennel Hill, trained by Keith Goldsworthy, claimed third place in the Albert Bartlett Novices’ Hurdle. Though Robin Dickin’s Restless Harry, who fell at the last when he was ahead of Kennel Hill, was clearly unlucky, Goldsworthy thought his horse may have got up anyway. “He was still galloping all the time. He was closing them down and looked like he was going into a place anyway,” said the trainer. “He’s an experienced novice, he’s entitled to be galloping on at the end because he’s a bit more mature and he’s kept on to the line. He travelled well but he never looks like he’s doing anything, does he?” he added. The horse had started at 66/1, but the trainer had taken 200/1 this morning. “His reputation said, ‘Be Careful’, but the price was ridiculous. Bit if it was all about favourites, we wouldn’t bother, would we?” he said. “If we could get him to win a little maiden now that may put his confidence up,” said Goldsworthy. Kennel Hill, who has form on both good to firm and heavy ground, was unaffected by the going, but jockey Jason Maguire said he felt that the rain was getting into the ground.